Albert Einstein was a theoretical physicist, philosopher and author who is widely regarded as one of the most influential and best known scientists and intellectuals of all time. He is often regarded as the father of modern physics. He received the 1921 Nobel Prize in Physics "for his services to Theoretical Physics, and especially for his discovery of the law of the photoelectric effect." 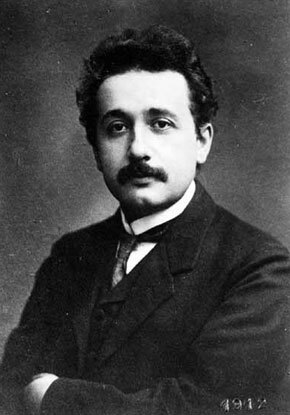 His many contributions to physics include the special and general theories of relativity, the founding of relativistic cosmology, the first post-Newtonian expansion, the explanation the perihelion precession of Mercury, the prediction of the deflection of light by gravity (gravitational lensing), the first fluctuation dissipation theorem which explained the Brownian motion of molecules, the photon theory and the wave-particle duality, the quantum theory of atomic motion in solids, the zero-point energy concept, the semiclassical version of the Schr�dinger equation, and the quantum theory of a monatomic gas which predicted Bose-Einstein condensation. Einstein published more than 300 scientific and over 150 non-scientific works; he additionally wrote and commentated prolifically on various philosophical and political subjects. His great intelligence and originality has made the word "Einstein" synonymous with genius. A human being is part of a whole, called by us the 'Universe,' a part limited in time and space. He experiences himself, his thoughts and feelings, as something separated from the rest--a kind of optical delusion of his consciousness. This delusion is a kind of prison for us, restricting us to our personal desires and to affection for a few persons nearest us. Our task must be to free ourselves from this prison by widening our circles of compassion to embrace all living creatures and the whole of nature in its beauty. The ideals which have always shone before me and filled me with the joy of living are goodness, beauty, and truth. To make a goal of comfort or happiness has never appealed to me; a system of ethics built on this basis would be sufficient only for a herd of cattle.